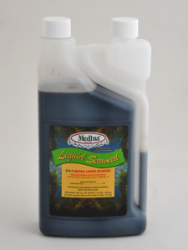 Medina Liquid Seaweed is an all-natural product that helps germination and root development. The naturally occurring hormones found in seaweed stimulate fruiting/blooming and root growth. Use as a transplant aid, foliar spray or soil drench. Use by itself or with other Medina products to grow more vegetables or make flowering plants have more blooms!